From my earlier failures, I knew that no matter how confident I was in making anyone bet I could still be wrong — and that proper diversification was the key to reducing risks without reducing returns. If I could build properly diversified (they zigged and zagged in ways that balanced each other out), I could offer clients an overall portfolio return much more consistent and reliable than what they could get elsewhere. Decades earlier, the Nobel Prize-winning economist Harry Markowitz had invented a widely used model that allowed you to input a set of assets along with their expected returns, risks, and correlations (showing how similarly those assets have performed in the past) and determine an “optimal mix” of those assets in a portfolio. But his model didn’t tell you anything about the incremental effects of changing any one of those variables, or how to handle being uncertain about those assumptions. By then I was terribly fearful about what would happen if my assumptions were wrong, so I wanted to understand diversification in a very simple way. I asked Brian Gold, a recently graduated math major from Dartmouth who’d joined Bridgewater in 1990, to do a chart showing how the volatility of a portfolio would decline and its quality (measured by the amount of return relative to risk) would improve if I incrementally added investments with different correlations. I’ll explain it in more detail in my Economic and Investment Principles. That simple chart struck me with the same force I imaging Einstein must have felt when he discovered E=MC2: I saw that with fifteen to twenty good, uncorrelated return streams, I could dramatically reduce my risks without reducing my expected returns. It was so simple but it would be such a breakthrough if the theory worked as well in practice as it did on paper. 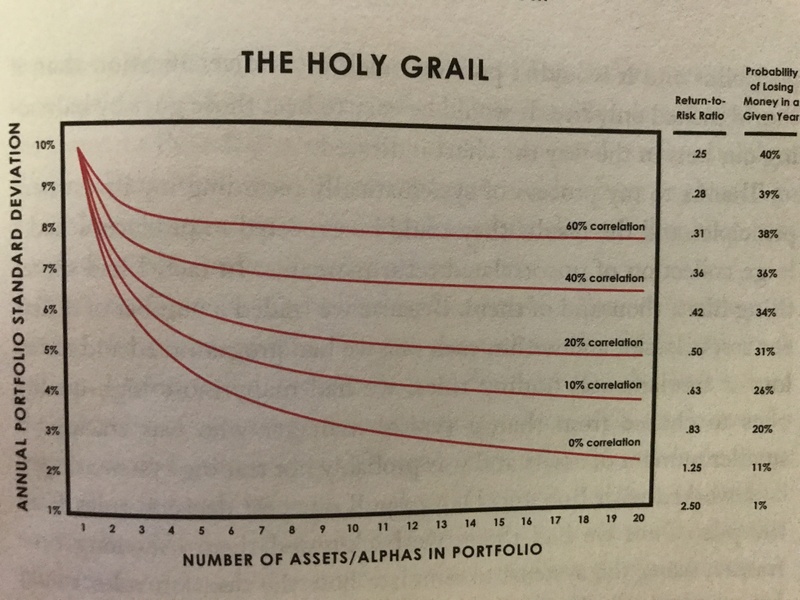 I called it the “Holy Grail of Investing” because it showed the path to making a fortune. This was another key moment in our education. As the Holy Grail chart showed, an equity manager could put a thousand 60 percent-correlated stocks into their portfolios and it wouldn’t provide much more diversification than if they’d picked only five. It would be easy to beat those guys by balancing our bets in the way the chart indicated. Thanks to my process of systematically recording my investment principles and the results they could be expected to produce, I had a large collection of uncorrelated return streams. In fact, I had something like a thousand of them. Because we traded a number of different asset classes, and within each one we had programmed and tested lots of fundamental trading rules, we had many more high-quality ones to choose from than a typical manager who was tracking a smaller number of assets and was probably not trading systematically. I worked with Bob and Dan to pull our best decision rules from the pile. Once we had them, we back-tested them over long time frames, using the systems to simulate how the decision rules would have worked together in the past. We were startled by the results. On paper, this new approach improved our returns by a factor of three to five times per unit of risk, and we could calibrate the amount of return we wanted based on the amount of risk we could tolerate. In other words, we could make a ton more money than the other guys, with a lower risk of being knocked out of the game — as I’d nearly been before. I called it the “killer system” because it would either produce killer results for us and our clients or it would kill us because we were missing something important. Diversifying with over 15 uncorrelated return streams and balancing out your return per unit of risk, through sizing and leverage (ie, leveraging bonds to equal equity on a return per risk unit basis), can get you to a balanced global or market-neutral position. This is where your risk is balanced out and you’re effectively clipping beta coupons from global markets and various asset classes. An important note I should make is that to build this market-neutral book you really have to understand cross-asset correlation. It’s not correlation in the typical sense, where you use a market lookback period of say three years to see how much in line those asset classes have moved together. The correlation has to do with the fundamental drivers of each asset class (ie, what are the economics that drive investors to buy and sell each asset class). At its most basic, this idea can be boiled down to two inputs of growth and inflation which when combined give you four stages. 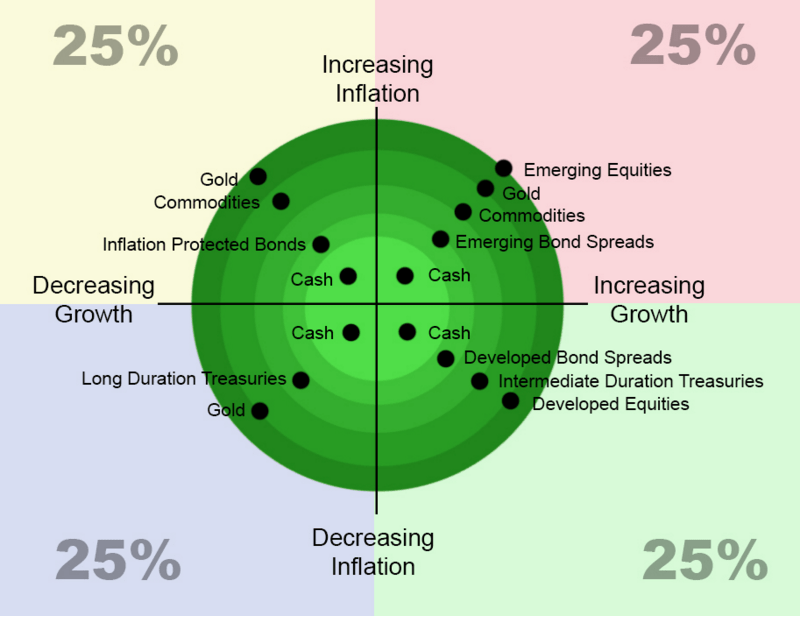 Different asset classes will perform well in some stages and less well in others, as the graph to the right shows. You can dive really deep into this and begin to do some interesting stuff — I’ll save that for another post on another day. But, as a global macro trader, I love the idea of having a market neutral book that collects beta in a smart risk-adjusted way. This gives me an excellent base from which to operate off of and build an alpha overlay by making what are typically low probability but high expected value (EV+) convex bets, preferably using leverage on top of my beta. This takes the pressure off me as the trader to always be in the market with a position and allows me to focus my time on seeking out the fat pitches and asymmetric trades that only come around every so often. I’ve long been a proponent of the old-school macro approach used by Soros and Druck where you’re highly concentrated. You have just a few eggs in your basket that you watch intensely. But a more optimal approach is a combination of the two. Use diversification to collect your beta and overlay that with a concentrated book for your alpha. If you would like to read wisdom from all of the macro legends click here to download our free Trading Greats guide!